In 2019, for the first time the Sri Chinmoy Oneness-Home Peace Run will encircle the entire globe in a calendar year, bringing the Peace Torch to every country of the Southern Hemisphere. 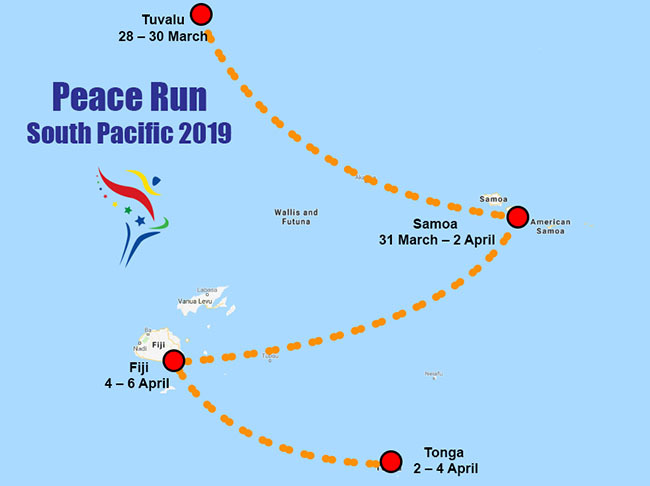 The Peace Torch will arrive into Apia on the evening of Sunday 31 March, spending two nights and one full day on Monday 1 April visiting schools and community groups. All who share a love for peace and a future better world are warmly invited to participate by holding the Peace Torch, walking or running with the Torch, singing or offering your goodwill.